Trade Show Job... What is Most Important to Revenue Generation? You've likely heard this type of story before: There were four people named Everybody, Somebody, Anybody and Nobody. There was an important job to be done and Everybody was sure Somebody would do it. Anybody could have done it. Nobody did it. Somebody got angry because it was Everybody's job. Everybody thought that Somebody would do it. But Nobody asked Anybody. It ended up that the job was not done, and Everybody blamed Somebody, when actually, Nobody asked Anybody. 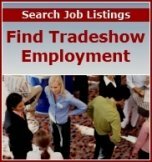 Question is… What is the trade show job? The job that Anybody can do, and Everybody thinks Somebody will do, but winds up being that Nobody does is the lead follow-up activity that is essential after the event is over. The Center for Exhibition Industry Research (ceir.org) says up to 80% of leads gathered at a show are not followed up. Bottom line, that translates into wasting 80% of your money. What's Your Purpose at the Show? If it's your responsibility is to gather leads, then that should be the main focus before, during and after the show. What if it's something else, like meeting with clients or recruiting employees? That doesn't absolve you of following up with leads. You still have to do it as part of your job. Define before the show what you consider a lead. Is it a company that will purchase within a certain time period? Has a certain budget? Is looking for a particular product you sell? You can separate the contacts into levels -- A, B, C or hot, medium, cool -- and work them that way. But they still have to be contacted as part of your trade show job. Develop a schedule for following up with your trade show leads. The first contact should come within 10 days of the end of the event. Otherwise people forget who you are. The trail becomes cool, then cold. Determine names and responsibilities at each step of the follow-up process. Job accountability is important. Make each person aware of what is expected of as part of his or her responsibilities, and who else is in the process. This is critical when the person staffing the booth is not the person who does the actual follow-up call. The farther and longer the process from the show site and date, the more chances there are to lose the lead. At minimum, follow-up with a thank you note to every contact you made. These people invested time and money to come to the show, time and effort to stop by your booth. The simple courtesy of a thank you goes a long way in today's fast paced and impersonal world. If you listened properly and were able to gather specific information, you can provide a quote, supply answers and have a real reason for the follow-up call. Your business card - people will remember a logo and spelling of names and companies. Be sure your card includes your business social media addresses. Any samples, price lists or references that will help speed the sales cycle. Remember, the trade show job that Anybody can do, and Everybody thinks Somebody will do, but Nobody does - well, that changes when all understand the importance of trade show follow-up. Article information by trade show consultant Julia O'Connor.